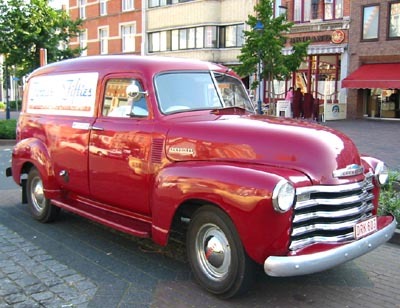 These are two Chevrolets panel trucks that we use for the club meetings of our Belgian club “Forties and Fifties American Cars Enthusiasts”. Both are manufactured in Antwerp at the General Motors Continental plant and have 6 in line engines and speedometers in kilometers. 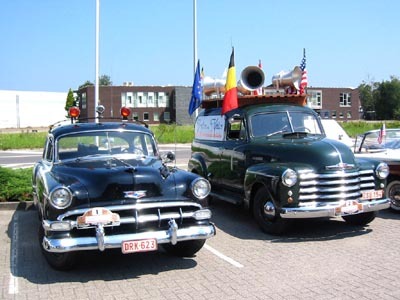 The green one is equipped with for loudspeakers and the flags of Belgium, the city of Antwerp, the European Community and of course the Stars and Stripes of America! We use it to open our meetings and U.S.-car parades. The parking lights and the turn signal lights on the green one are not correct and has to be removed one day and replaced with the originals. 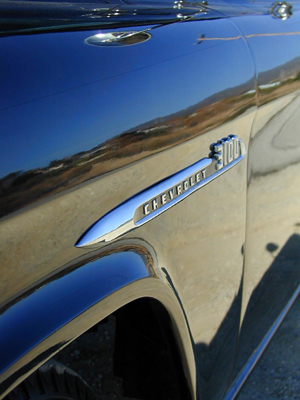 At the side of this panel truck, my 1954 Chevrolet Highway Patrol car. 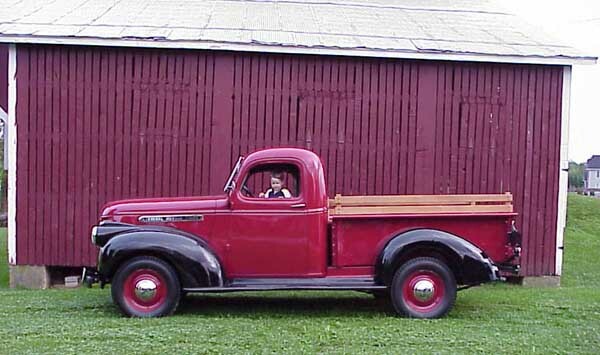 The dark red panel truck is also mine but I use it for our club meetings as the last car to close the car parade. He will need some more parts of Jim Carter classic truck parts! President 40’s & 50’s A.C.E. 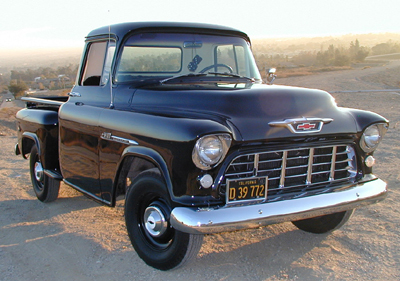 My truck is a 1955 Chevrolet 3100 First Series Deluxe Cab. 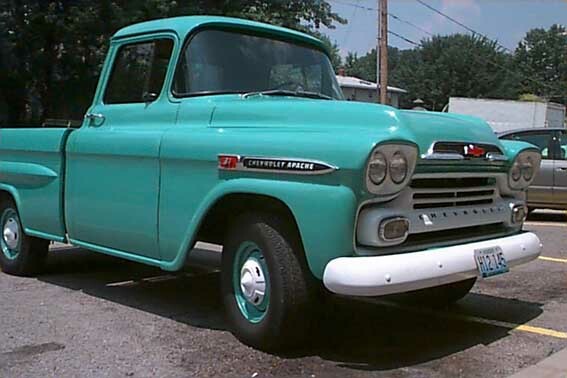 My wife used to ride in this truck as a girl in the late 1950’s. It belonged to her neighbor, the original owner. That neighbor drove it for years, and then sold it to another neighbor who used in on his farm for years. 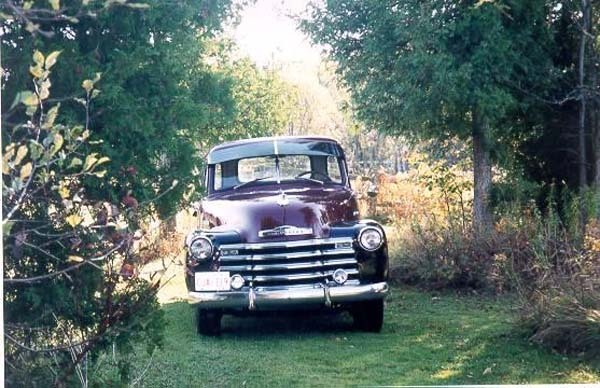 Then it was parked by the creek for about five years before I spotted it while on a Sunday drive in 1992. It was quite rusty and had a set of cattle racks on it. But, I couldn’t resist. 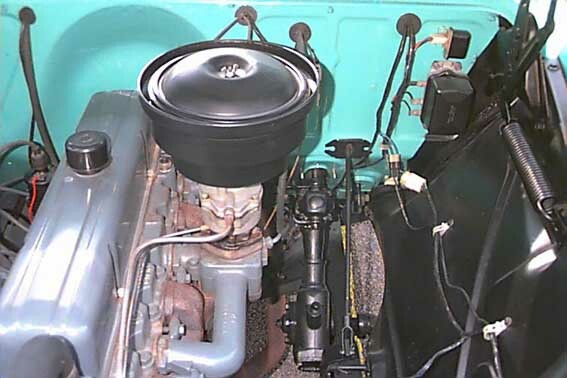 With a new battery, a little gas down the carburetor, a slightly burned cousin (who now knows not to pour too much gas because it just might backfire), we started it and I drove it home. 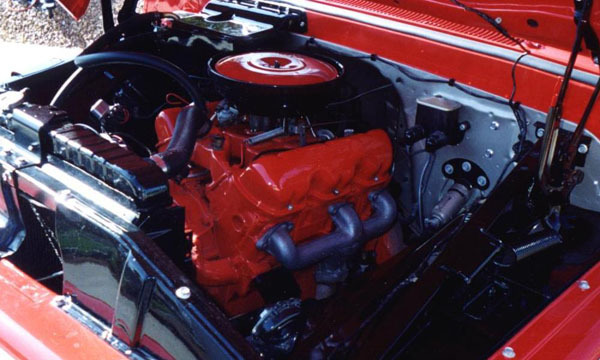 I soon had the original 235 engine rebuilt, then embarked on the long journey with Jim Carter’s Antique Truck Parts to restore what I considered to be a real diamond in the rough. 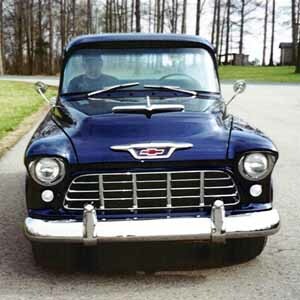 I bought my parts from Jim Carter’s, and turned the project over to pro restorer Monty King at King’s Restorations in Cloverdale, Virginia so the body would be done right. 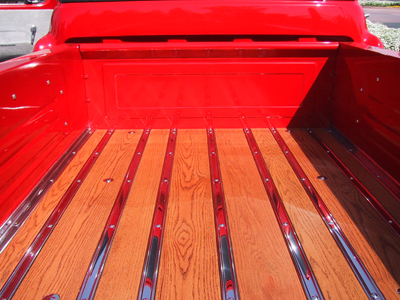 The truck has been slowly and meticulously restored over the last ten years and is in near-perfect, near-show-quality condition. The list of items purchased from Jim Carter’s is extensive. This is a ground-up restoration. All body parts were removed and sand-blasted down to good steel. All rust was replaced with new steel, or the entire part was replaced if necessary. 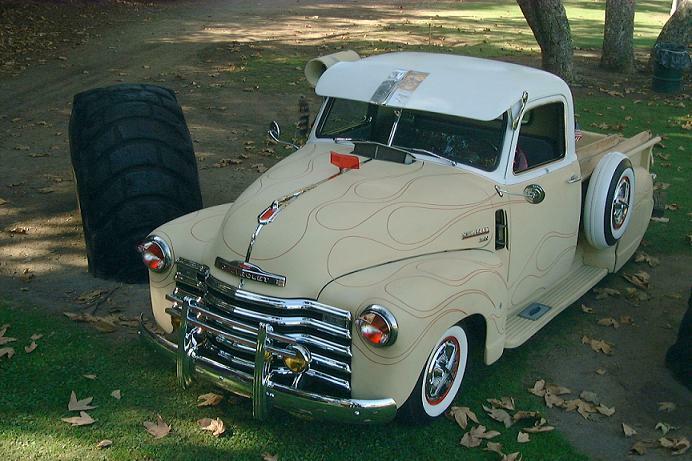 Minor cosmetics to the engine would make it a show truck. Body is perfect, mechanics excellent. Truck is very original and can be driven anywhere. It has 127,000 actual miles. 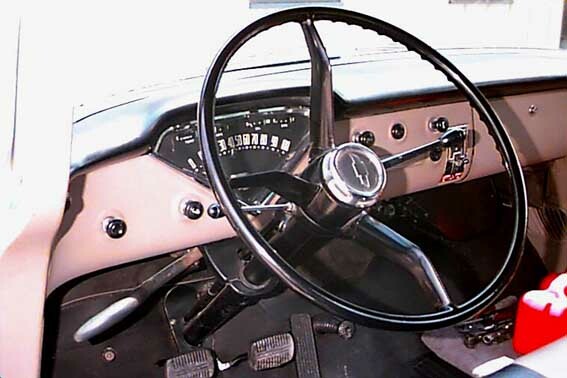 It does not currently have a radio installed. 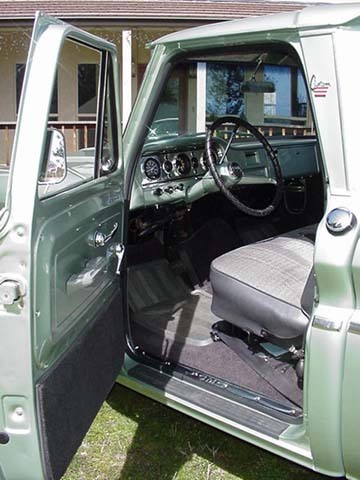 All colors are authentic, Juniper Green and White two-tone exterior, with two-tone interior of dark and light green. (Many thanks to the staff at Jim Carter’s for helping me get the exact colors!!!) I kept it as a 6 volt system and I have several original parts as spares. I have enjoyed the truck and the project. It is great to drive. My father-in-law was partly the reason I undertook the project, but he passed away shortly before it was completed. 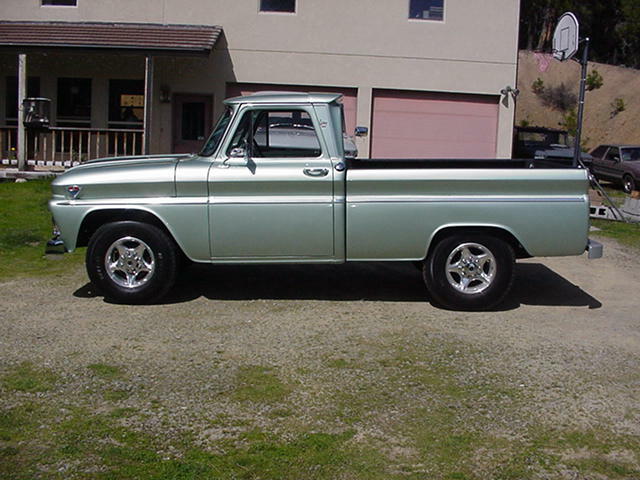 I would consider selling the truck to someone who would like to take it the last bit to perfection. 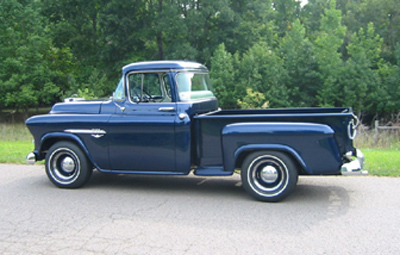 This truck was purchased by my Grandfather in 1962 with 10,000 miles on it. 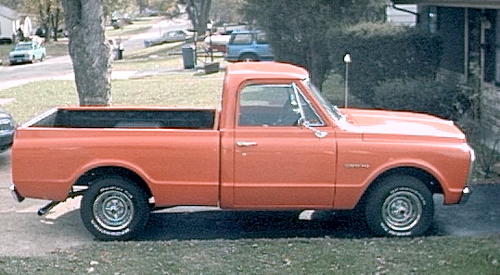 It was used as a work truck by Grandfather until 1974 when it was given to my father. 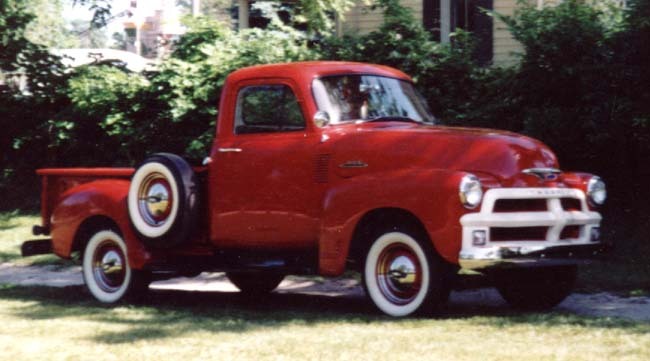 My father used it as a daily work truck until 1991 when he and I restored it. There is no rust or damage. It is truly a family heirloom. Thank you for allowing me to share my truck with you. 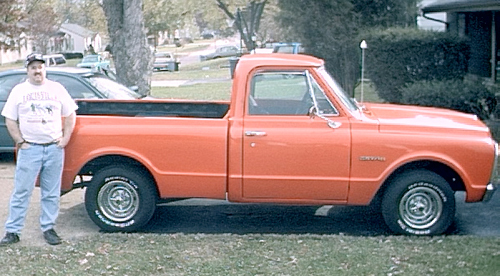 This is the only truck I have ever owned, and really the only kind of truck that ever held much interest for me. 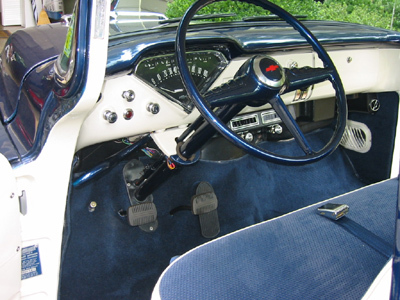 The first 1955 (second series) I ever saw was purchased by my best friend’s father. Not only did I think it beautiful, it was FAST! 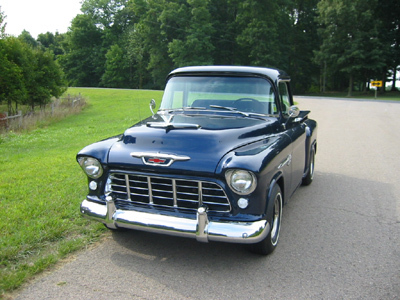 While attending an auto show in South Carolina I saw a pristine restoration of a ’55 and asked the owner if he new of another that I might restore. He knew of one in Broadway, NC and so my story began. 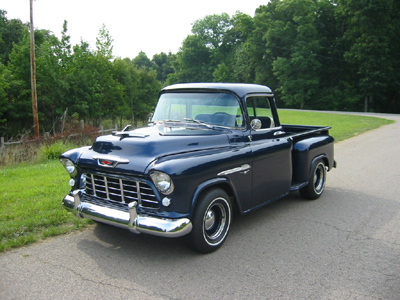 My truck was purchased new in early 1956 from the Pinehurst Motor Co. in Pinehurst, NC and was loaded with just about every available option except automatic transmission. Since that time it has never been titled outside the state of North Carolina. 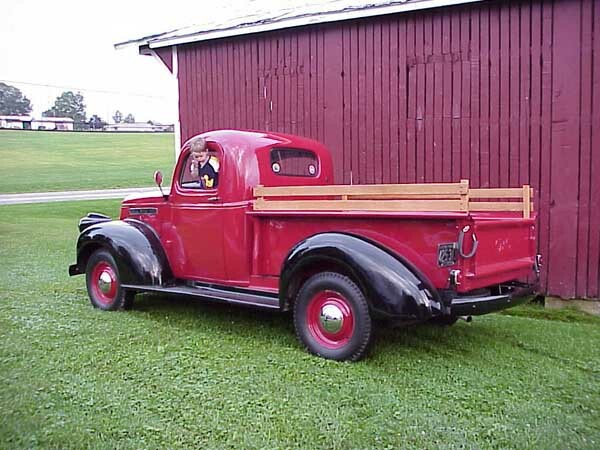 The truck had been partially disassembled for restoration, and parts were scattered in several farm outbuildings. It was loaded up and carried to Siler City, NC where I was fortunate enough to find interested people to work on the restoration. 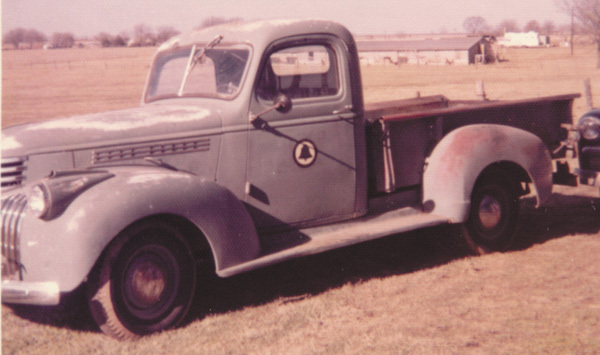 The truck was then completely taken apart, sandblasted and re-assembled on the fresh chassis. 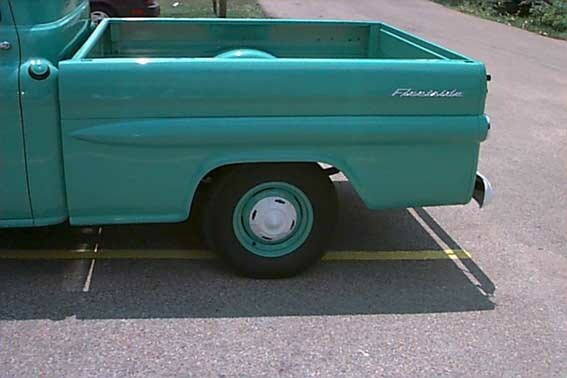 My goal was to retain the original appearance while at the same time achieving a roadworthy vehicle. I hope you enjoy the results. 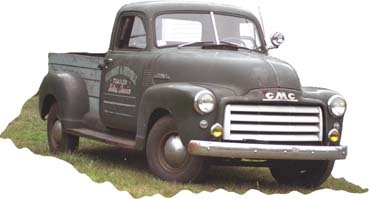 Jim Carter Truck Parts was my primary parts supplier. The parts department, was most helpful with service and advise, especially Sheba Queen and Kelly Mitchell. I am also grateful to my friends, without, whose assistance the restoration could not have been done in less than a year, if at all. Special thanks to Larry Holder, Dale Testerman, Bobby Lambert, and Luis Borrayo. 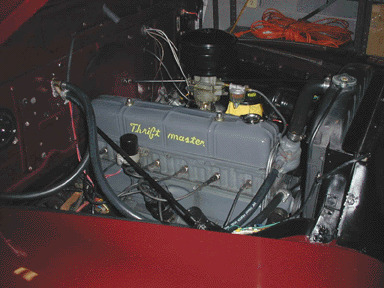 Engine ‘ 305 CI small block Chevy with Edlebrock intake and Quadrajet 4 barrel carb. Brakes ‘ Dual master cylinder, power assist. 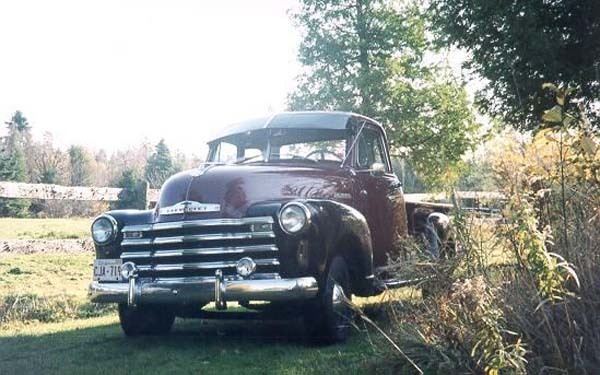 This 1951 Chevrolet 3100 has been in our family since my dad bought it new in 1951 in Wooster, Ohio. It has a 216 cu. in. 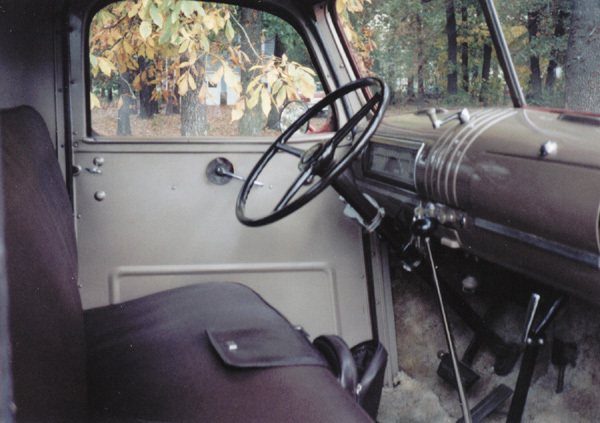 motor, four speed transmission, original radio, that still plays, the original bill of sale and spec. sheet. My girl friend and I started restoring it in 1992. It took 5 years and was done outside because we had no garage. 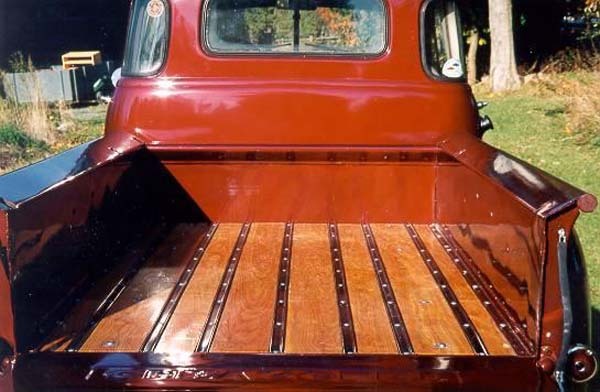 The truck is completely stock, except for the paint and upholstery. 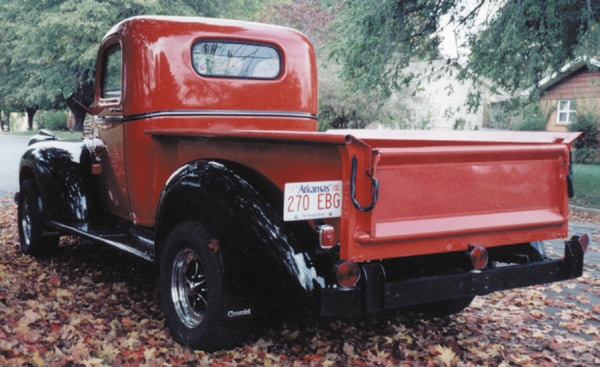 Every part was ordered through Jim Carter Antique Truck Parts. The hardest parts to find were the 6.50-16 snow tires. 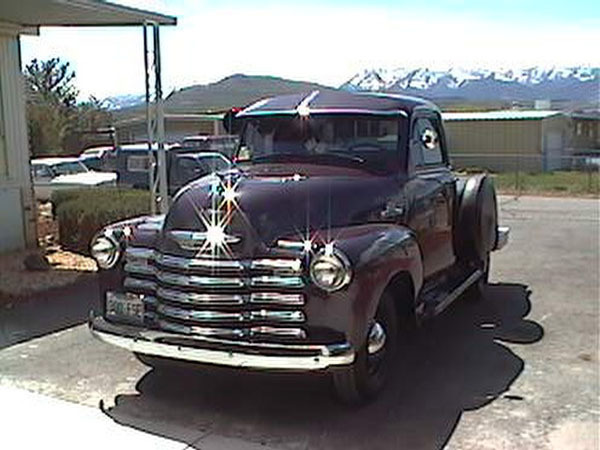 The truck is a daily driver and is entered every year in ‘Hot August Nights’ .. We also put it in shows and parades. I wanted to thank Jim Carter Antique Truck Parts employees for their effort in getting us all the parts to complete this truck project. All the parts we ordered were just like original and we sent nothing back. Working with a company like Jim Carter’s made the project a lot more enjoyable;.. 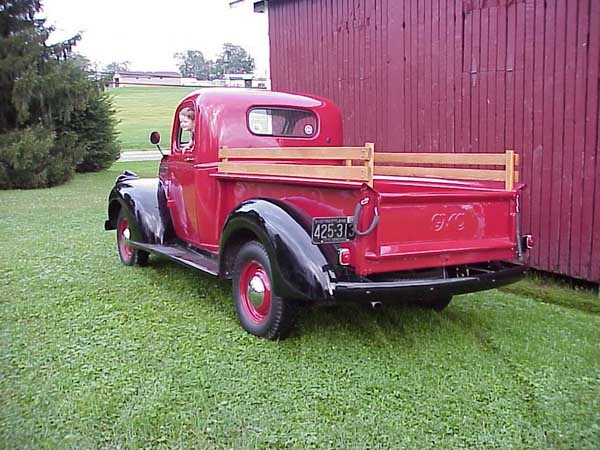 Enclosed is my 1/2 ton 1935 Chevrolet Light Delivery Pickup as they used to call them. 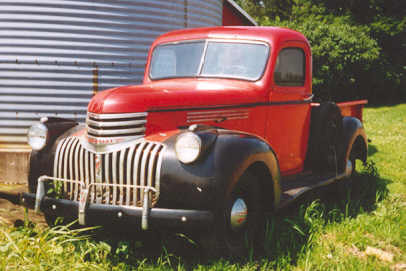 It is a truck found in a barn outside of Eugene, Oregon. The chassis was outside and the rest of the truck was in buckets and/or hanging on the walls and from rafters. 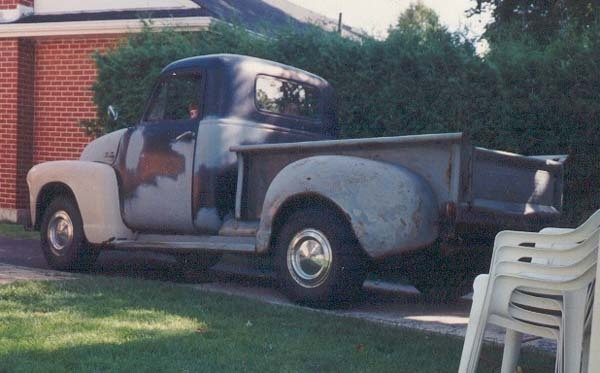 I hauled the rusty stuff home and began the beadblasting, sanding, powdercoating, painting, and mechanical restoration in May 1995, and had the front of the truck running by September 1995. And with Jim Carter’s help on many mechanical, and chrome parts in addition to others from Canada to Texas it is now a great driver. 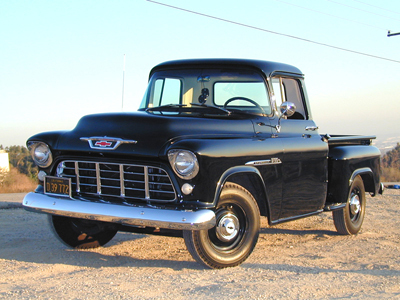 This month, a 1954 1/2 ton Chevrolet truck is featured.This truck, owned and restored by Rudy Parmenter, is a life goal. Rudy says, ‘My 54 was bought from a Texas owner and we are the second owners. 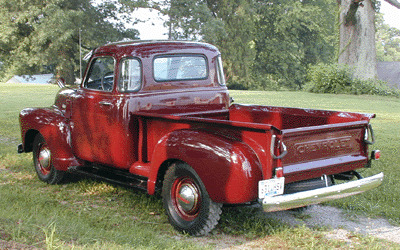 The truck was dismantled and a ground-up restoration was completed in several years to restore it to its original condition back in 1954’. 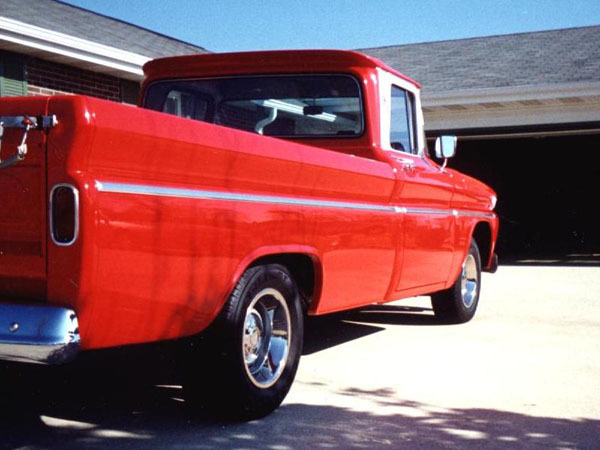 This truck has 51,000 original miles and original paint. 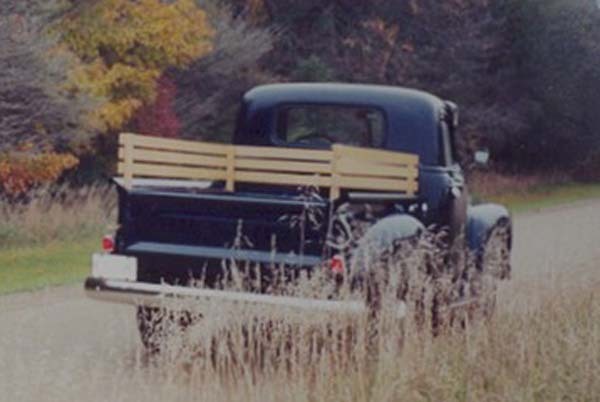 The truck sat for over 25 years unused. The only addition to the truck from the dealer is side-mounted tires. The white wall tires are a dealer option. 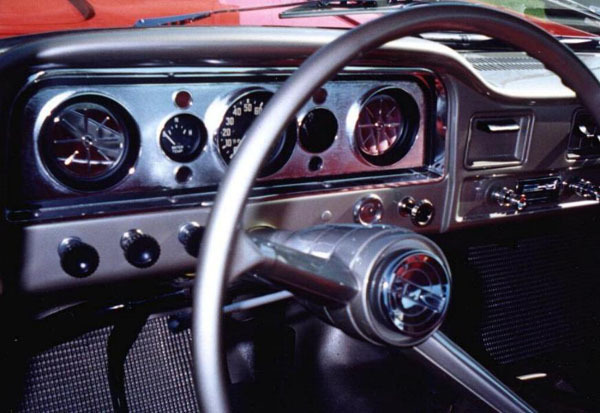 It has a deluxe two-tone paint job inside, and original factory radio that operates. It also has a fresh air heater and a right tail light. 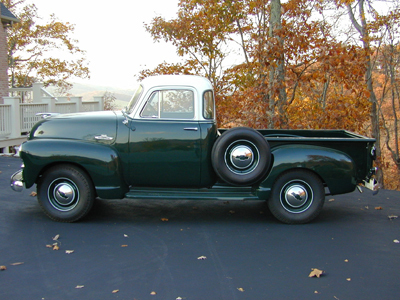 This truck has original Chevrolet running board protectors, factory turn signals, stainless front and rear bumpers, stainless steel beauty rings and hubcaps. 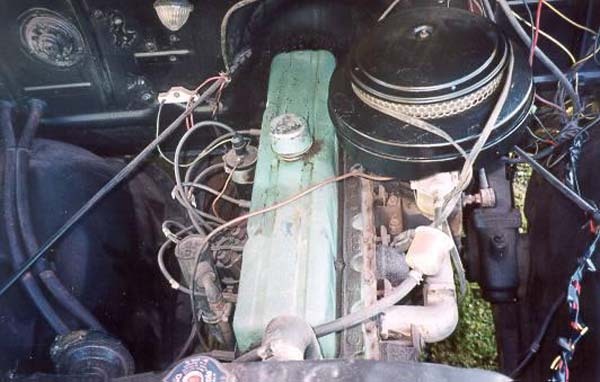 It has a 235, 6 cylinder engine, 3-speed on the column (all have been gone through and restored to original condition). 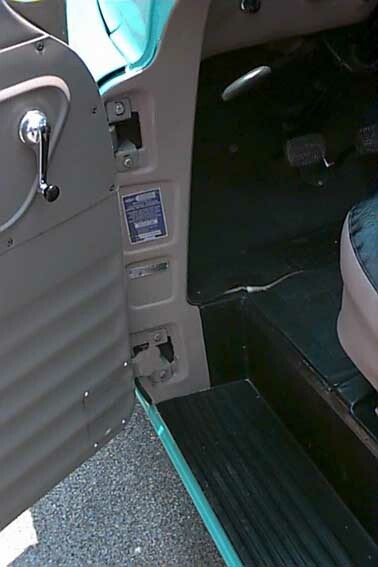 All window tracks and door locking parts have been rebuilt and/or replaced. The truck also has a dealer installed oil filter. 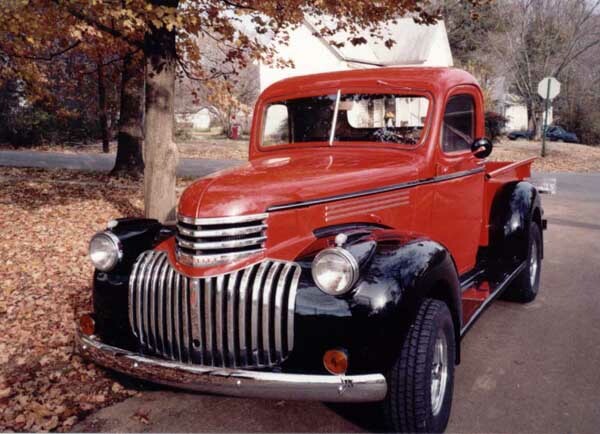 ‘We cannot say enough praise for all of the staff at Jim Carter’s Antique Truck Parts. 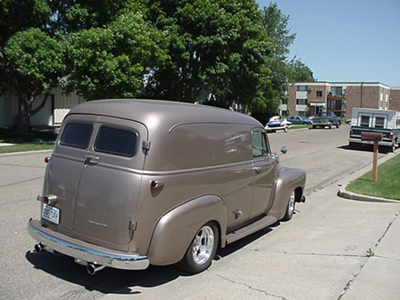 They have all been very patient and supportive in helping us restore this vehicle. They are very knowledgeable with their technical support. 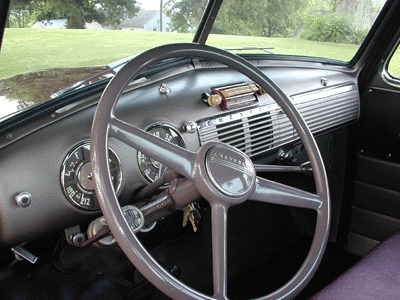 Parts for a 54 Chevrolet are few and far between. All of the staff has been very supportive during the time it has taken to find all of its many ‘one of a kind’ parts. 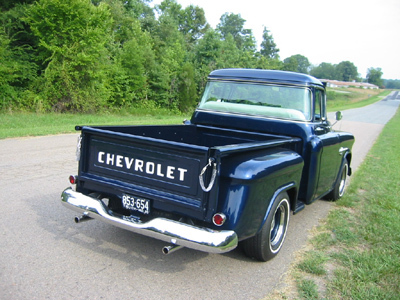 We have also been able to find a few things through e-bay and have met new antique Chevy truck owners’. Part of the fun of restoring this truck has been trying to find additional accessories that add to the over all display when at car shows. 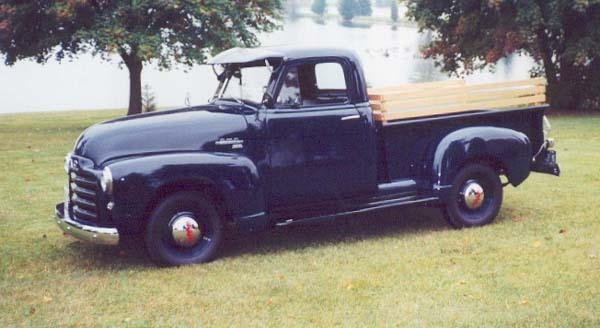 During the past several years, we have found a 1954 truck data book used by salesmen, a 40 page 1954 sales catalog, an old tissue container that still had a box of tissues with Perry Como on the outside and a magazine ad from May 1954 with a picture of three 1954 trucks. My family and I have had it in several shows in Southwest Missouri. Many folks visit with us about the 54 and share their stories. 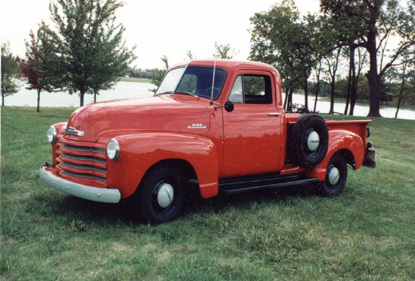 Most folks remember their 54 truck as the workhorse around the farm or in business. 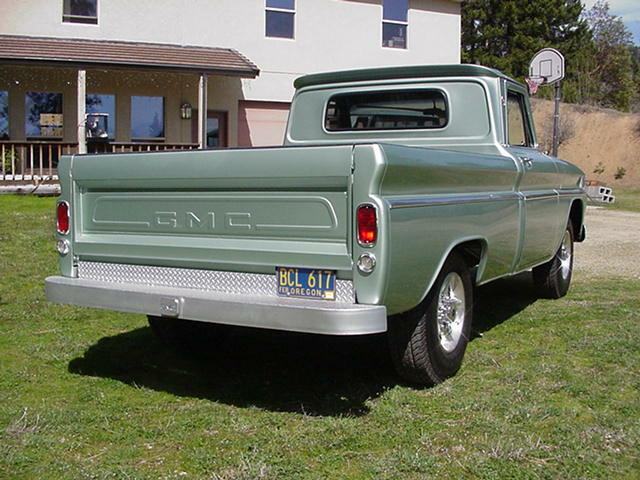 Although this truck design was only manufactured for one year, it holds a special place in the hearts of those who drove her. 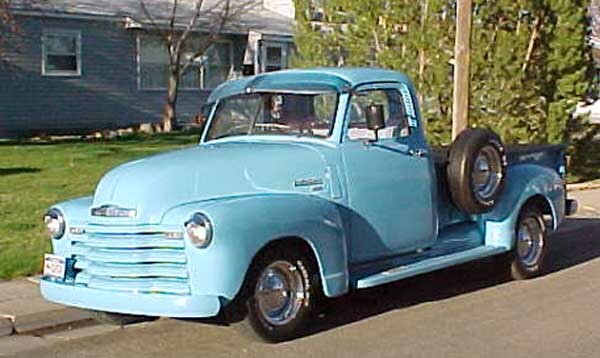 This is my 1950 Chevrolet 3100 Series pickup truck. I bought it around seven years ago for a measly $800.00. It was in decent shape. No chrome and primered and painted about eight different colors. 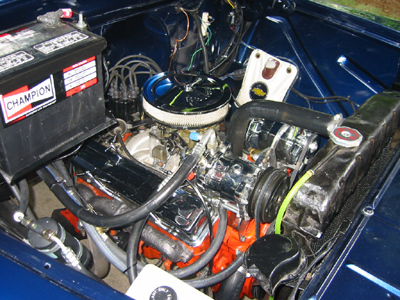 It has a small block 350 motor backed by a 350 turbo trans. It rolls on 14 x 6 inch rims with G 78 – 14 Commander 2 1/4 whitewalls. Shortly after I purchased it, I tore it down to just the cab and the motor. That’s about the same time I got lazy so the truck sat for the next five years. During which I started buying all the chrome and accessories and pretty much every thing else. Before I knew it the millennium was upon us. 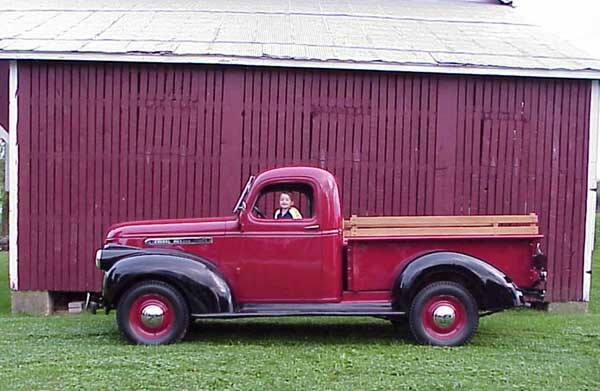 I said to myself that I wasn’t going to start out a new decade without the truck so about six or seven months prior to 2000 it got in gear and went to work. I sent it out to get primered and what a nightmare that was. It came back worse than when I sent it. The people did a terrible job. So all my prep work from before was a loss. I had to sand it down to get it the least bit presentable. With the help from some good friends of mine ( you know who you are ) it was finished by the first part of December…..Just in the nick of time. After that it’s been a series of progression. 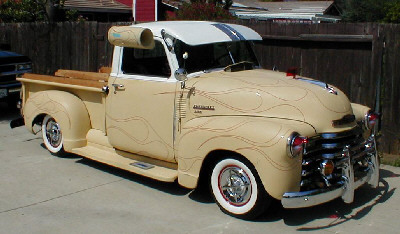 More accessories, then the flame pinstripping, installed a stereo ( CD player, amp and several speakers ), flame thrower kit in the exhaust, etc… etc…. I’m sure that I’m not even close to completion (are they ever really finished? ) My next big project is to install some sort of air assisted suspension…. 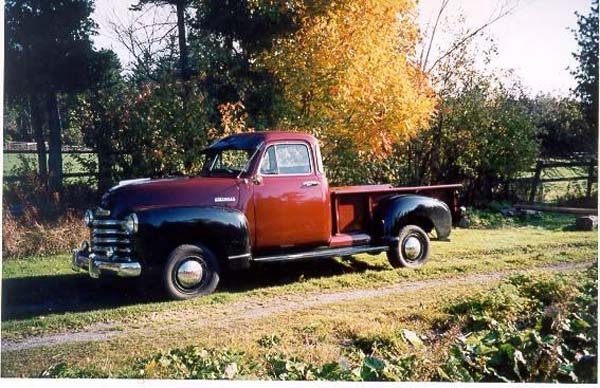 I have begun to restore my 41 Chevy 1/2 ton with parts from Jim Carter Classic Truck Parts, An oldie but a goodie, I worry that I will do harm to the value by changing things too much, The shop manual I ordered from Jim Carter has proven to be a valuable asset to the restoration of this truck. The sale of this truck will be applied to the mortgage of my house. Then again by the time I finish the truck I may have the house paid for and have to take a second mortgage to pay the truck bills. 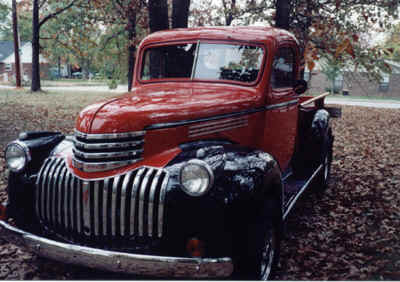 All is well that ends well, and a shinny 1941 Chevy Truck will be on the road again and cruising down the highways of Americas Heartland. I bought my truck from a guy in Illinois. It was halfway done and I completed it. I put the tires and wheels on it, rebuilt the motor and transmission, put all new chrome bumpers on the front and rear and new mirrors. 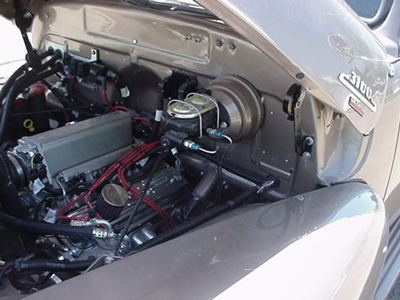 The motor is a 350 Corvette with a 280 Comp cam, Keith Black pistons , and a 750 Carter carburetor. I’ve been working on it about 4-5 years. I just put a disc brake conversion on it too. Also all new bushings, front end parts, and all new rear parts. 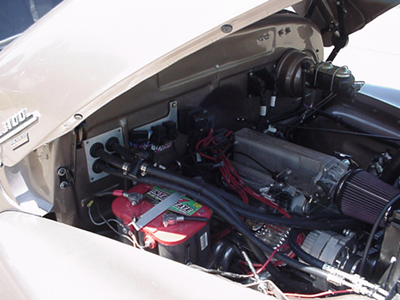 It has a 400 turbo transmission with a 3000 stall speed converter. Its never ending, all the cool stuff you can do to these trucks. DANNY C. ST. LOUIS MO. 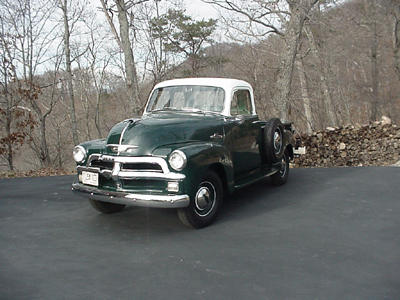 I have a 1954 Chevy Pick-Up Truck which I bought and restored in Brazil, using a lot of parts I imported there, from Jim Carter Antique Truck Parts. This was about 5 years ago. Today this truck is in Miami, where I have moved from Brazil. It is my everyday car and everybody loves it. 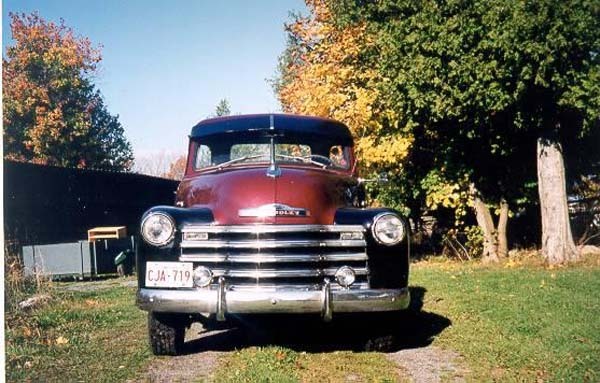 Hello Jim: My name is Paul McGarr and I bought my “1951 GMC” in 1994. 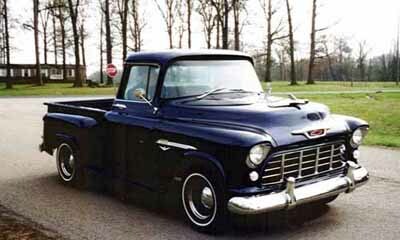 I always wanted one because my dad had a 50 Chevy 5 window when I was a youngster. 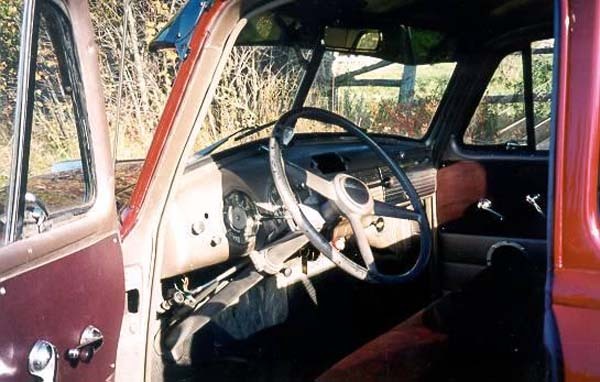 Originally I wanted to buy a Chevy 5 window but could not find one in half decent shape. 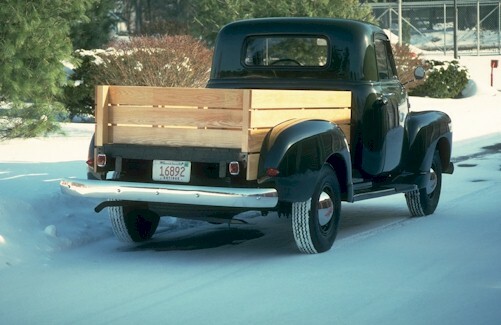 I should mention that I live in Guelph, Ontario and we have winter snow and road salt to deal with so there isn’t many good old trucks from this area. 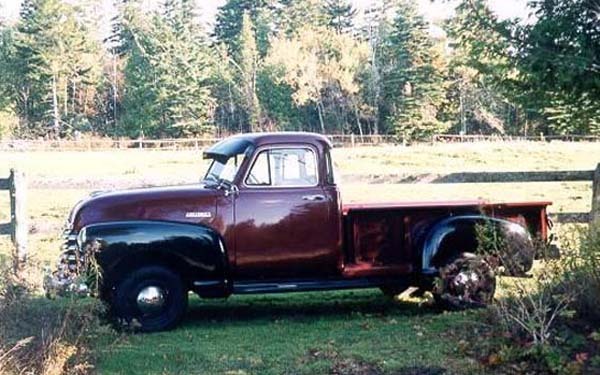 I did find one from Alberta and even though it wasn’t a Chevy, it looked almost identical except for the tailgate and front grille and parking lights. I wanted my Dad to help me restore it but, unfortunately he became ill and passed away before it was finished. He did get to see it about 75% finished and I made him drive it out my driveway. I’ll never forget the glow in his eyes. I finished it in his memory and always smile inside when I look at it because I can still see him in it, driving out my driveway as sick as he was, he even had a catheter in at the time. 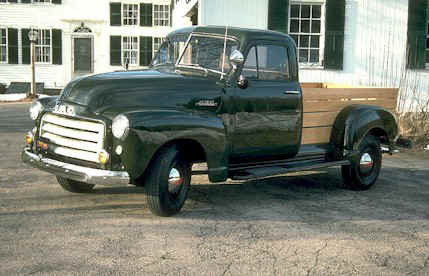 I am sending a picture of my truck for all to see. 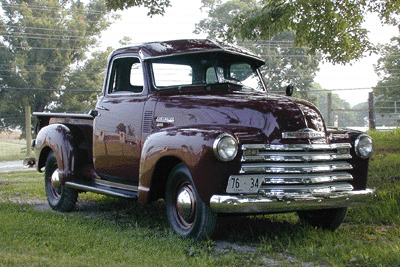 Keep on restoring those old advance design trucks. P.S. I almost forgot to mention I got a lot of new parts from Jim Carter’s as well as help and information over the phone and by fax. Thanks I couldn’t have done it without your expert and professional help. 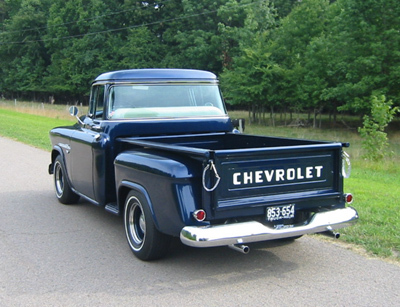 This month’s featured truck is a prime example of how an early Chevrolet Fleetside appeared when new. 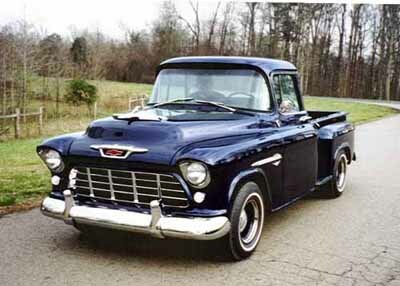 Few near 100 point restorations of GM’s early fleetsides exist today, so this little truck is a real attention getter. Looking at this like new pickup is as if going back in time. It is even painted the original Galway green, so popular during the late 1950’s. 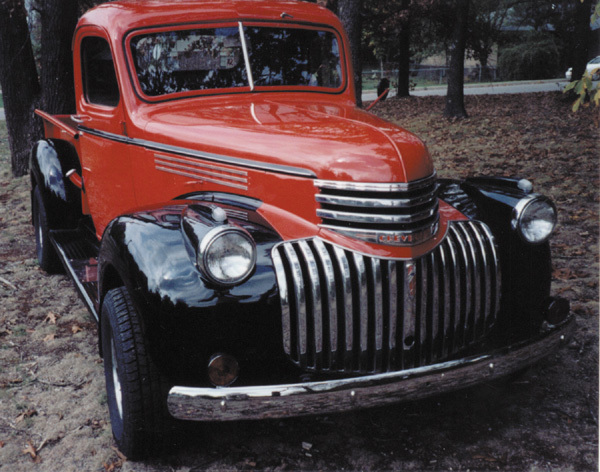 The owner is Olen Moore of Odessa, Missouri. 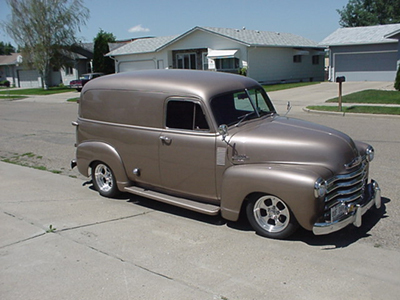 He has recently completed a detailed three year restoration of this fleetside. It had not been exposed to major abuse during its 42 year life and therefore was an excellent candidate for this exact frame off restoration. Most parts were still in place so there was no guessing as to how the truck should be reassembled. Of course, most parts needed replacing or restoring and Olens skill has made this pickup new again. To keep it just as it was from the factory, Olen rebuilt its original 235 six cylinder engine and kept the column shift 3 speed. It drives just like new and nicely keeps up with traffic. Owner: Joe Clark – Knoxville, Tenn. It took me 3 years to rebuild this truck from scratch. 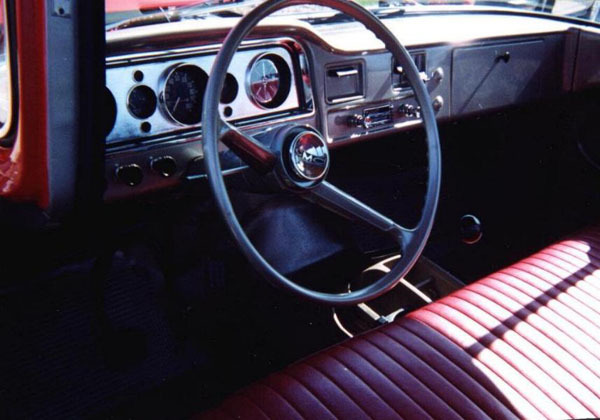 I did all the work myself, painting, body work, and mechanical (even restored the radio), all with the help from the folks at Jim Carter. 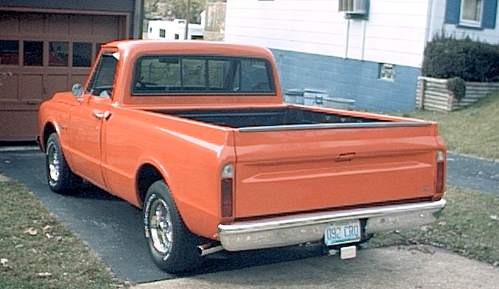 This truck is original except that I substituted a 235 (disguised to look like a 216), converted it to 12 volts, put in an alternator, and used walnut for the bed. 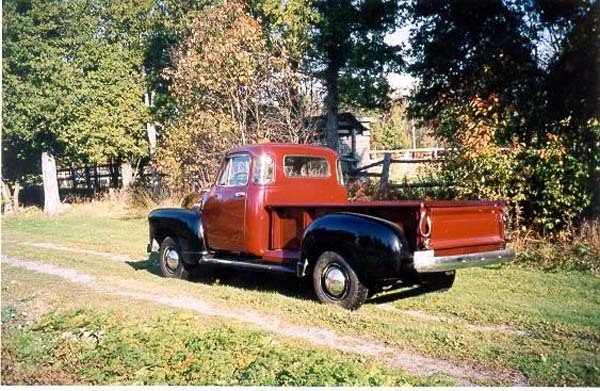 This was my first restoration and, thanks to the folks at Jim Carter Antique Truck Parts, I can’t wait to do the next one! 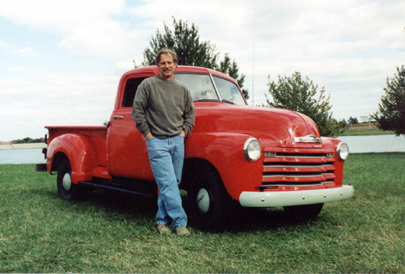 I bought my truck several years ago and have been using Jim carters for parts since then. We bought the disc brake kit from you as well as the wood for the bed, and a few other parts here and there. 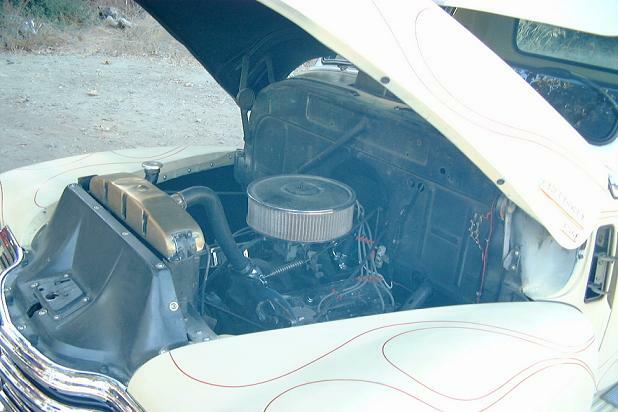 The truck has a 350 Chevy motor power disc brakes with a 79 olds cutlass rear end. We have won two second place trophies so far. I still have a ways to go though. I have always had great service from Jim Carters. 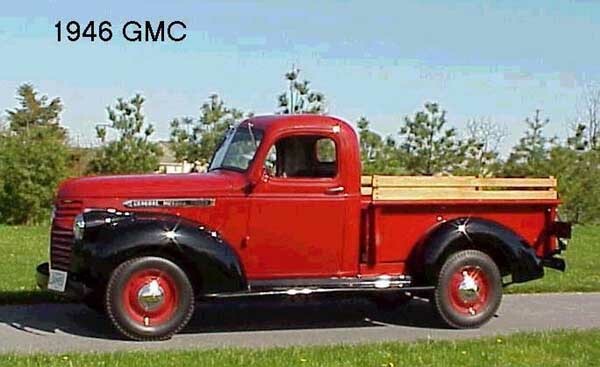 This is my 1946 GMC 1/2 ton pickup. It is designated Model EC-101. 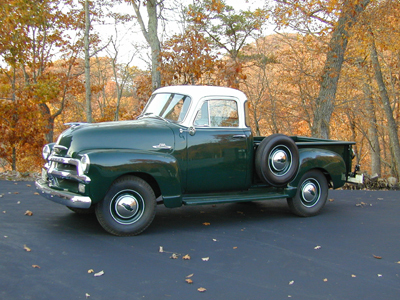 I purchased this truck two years ago from the man who restored the truck with the exception of the bed. He had built a wooden bed from pressure-treated pine. 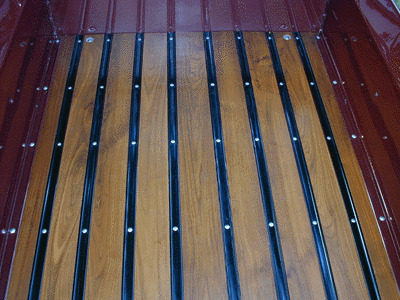 Fortunately, he had the original metal bed, which has its original all-metal floor; and it was in surprisingly good condition. I had a body shop sand blast the bed and my local vo-tech school did the paint work. 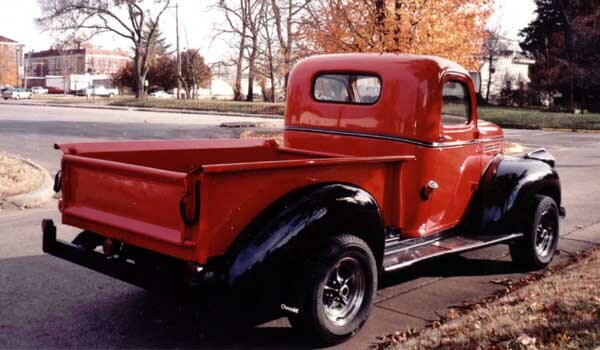 I was given several old Jim Carter Truck Parts catalogs with the truck and found out quickly that Jim Carter is an amazing resource for owners of these trucks. 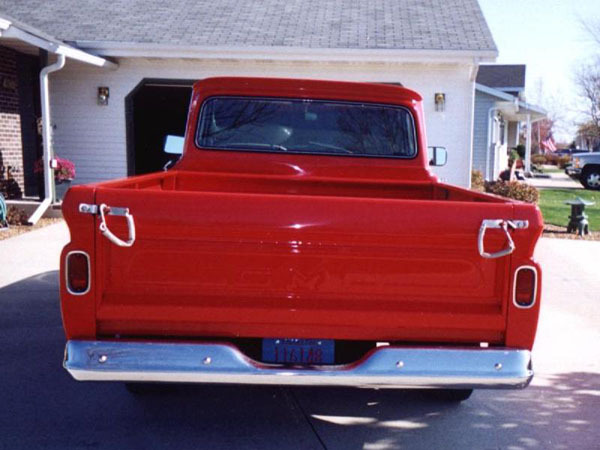 I purchased the rear fenders from Jim Carter and they are clearly the best fiberglass parts I have ever seen. 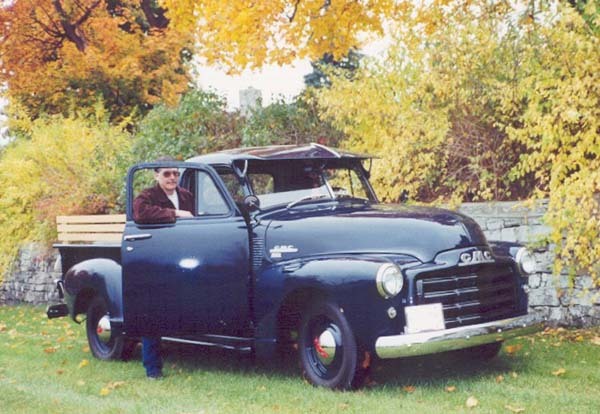 The truck was featured in the May/June 2000 issue of “THIS OLD TRUCK” magazine. 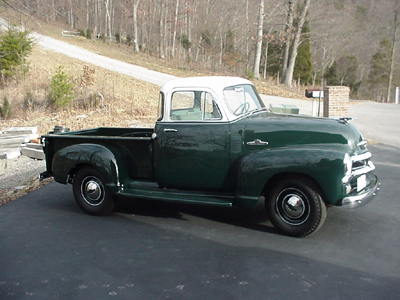 It is quite rare by comparison to the ’41-46 Chevy trucks it closely resembles. 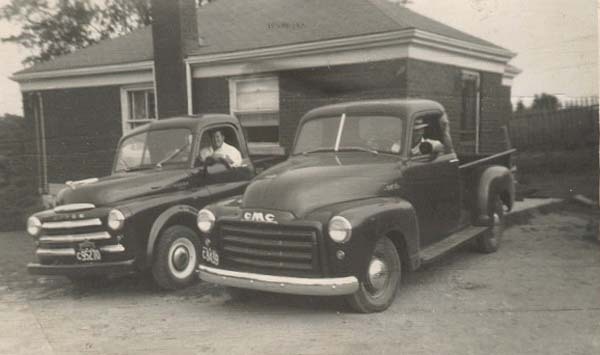 Happily, Jim Carter caters to both Chevy and GMC. 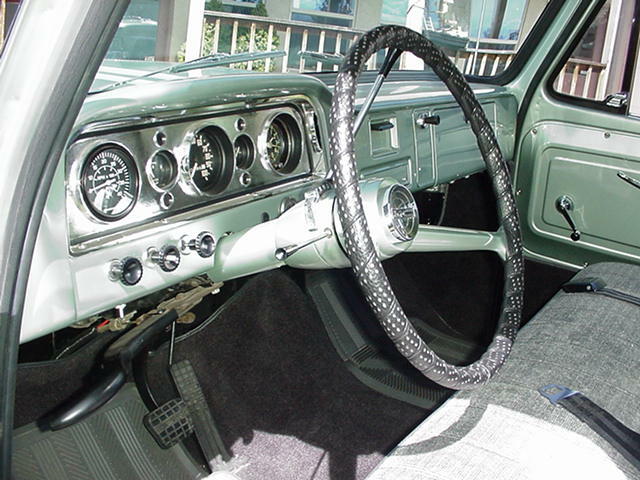 I drive the truck frequently during the warmer months of the year. 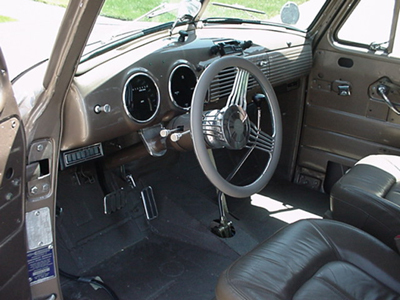 The 4-speed transmission requires double-clutching which is a skill that takes some practice. 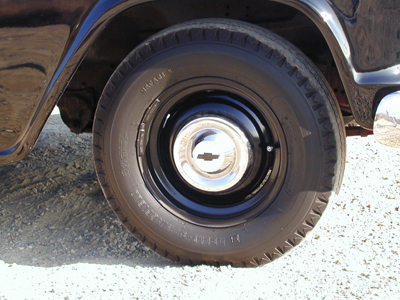 The tires are 6.50 x 16, which were an option to the standard 6.00 x 16. The result is a little better highway speed. I am considering the newer rear end gears to change the 4.11:1 to a 3.55:1. Of course, Jim Carter offers the parts. 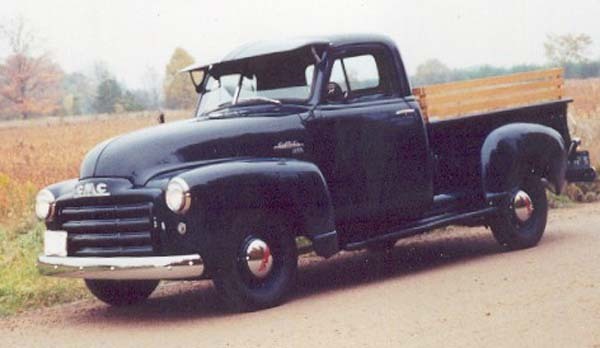 I bought this 1946 Chevy truck after it had served for many years in the Bell Telephone System, the prehistoric internet that Bell Labs would later upgrade. After helping with the creation of the net, the truck was in pretty sad shape. The guy I bought it from had overhauled the 216 motor and was starting a restoration but wanted to sell it. Unfortunately, he had no antifreeze in the water, and, when we started it up as we were discussing the sale on a January day after a cold snap, it formed a boiling cloud of steam from the exhaust and a river flowing down the street from a geyser spewing out a crack in the side of the block. We discounted the price to $150 and my dad and I towed it home. First, I dealt with the boat anchor I had for a motor. I disassembled it to the bare block, had the cracks welded, put it back together, put in some powerful stop leak; and to my amazement it ran just fine. Then I proceeded to the treasure hunt – finding the various body parts. It has original steel for everything, plus several items I ordered from Jim Carter. 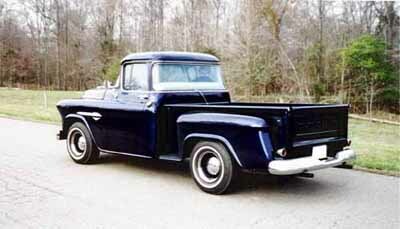 I painted it blue and black and drove it and showed it that way for several years. 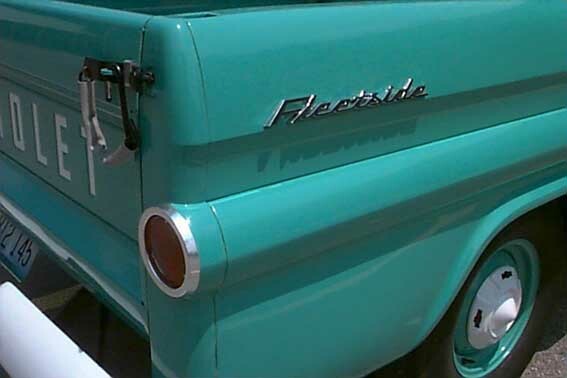 I loved the way it looked, but the running gear was just a little slow and weak for modern cruising. I had no trouble with the busted up motor, but the other things were becoming a problem. So 14 years ago I did a makeover. 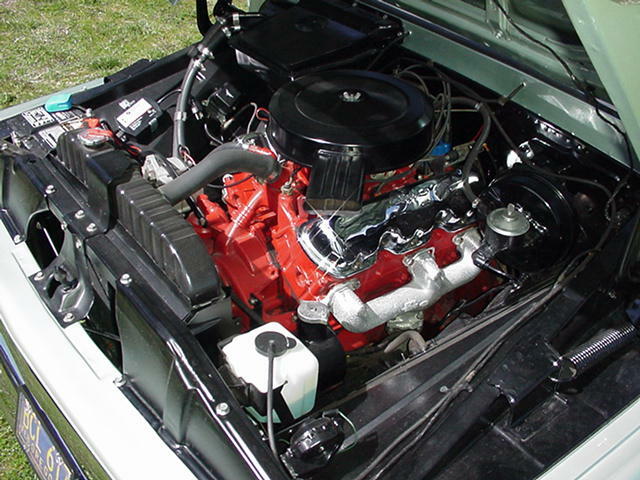 I had it outfitted it with a Chevy 305 V8, automatic, and an A frame assembly on the front from a ’75 Chevy pickup, which will bolt neatly to the frame with a pair of 3/8″ steel shims and provides power disc brakes and power steering. 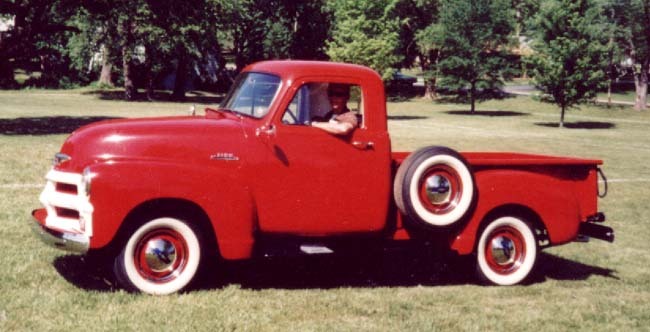 I repainted it the Swift’s red (now that it was so swift) and kept the body and interior as close to factory original as I could; there is no law that says you must deviate from the natural beauty of these trucks just because you put in a V8. 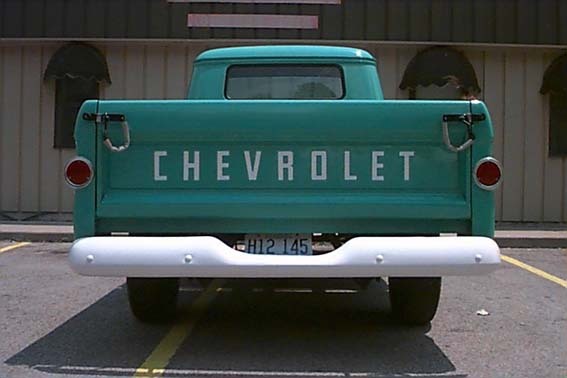 You can certainly improve how they drive, but, in my opinion, you can’t improve much on what the staff at Chevrolet thought out for how their trucks should look. 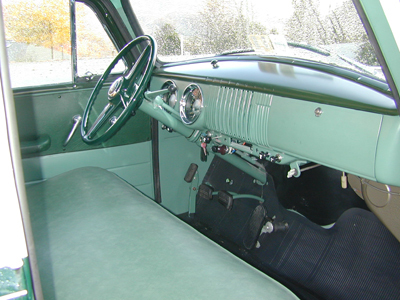 It was restoring the body and interior to factory original that was the most difficult part of the entire project. Finding the parts was not easy, and Jim Carter’s was the ace up my sleeve there; but far more difficult was finding reliable information as to what was factory original. It was here that Jim Carter’s proved to be a unique resource. 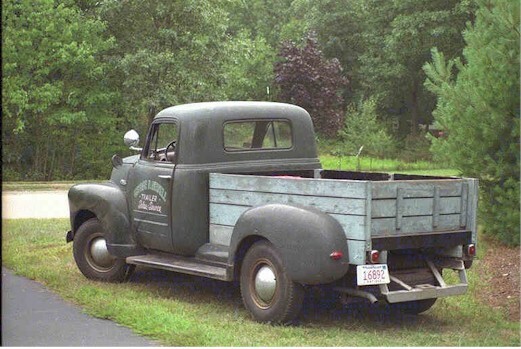 I inquired at salvages that are highly regarded for specializing in antique trucks, and got either “I don’t know” or contradictory information. I e-mailed the AACA in Hershey and got “We don’t know. Try these three organizations.” I e-mailed the customer service arm of Chevrolet, which is supposed to be able to answer all your questions about models past and present, and got “We have used all the resources at our disposal and can not answer your questions.” I asked Jim Carter’s and they either gave me answers immediately or said, “We’ll check and e-mail you an answer”, which they did. After having received so much contradictory information from other sources, I was not convinced. 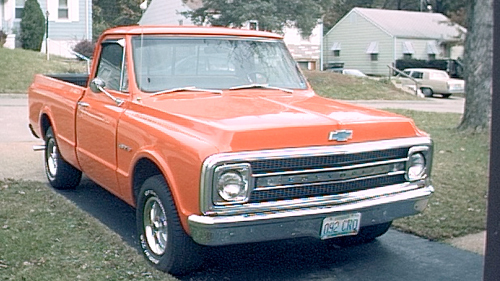 I hunted down some old photos of Chevy trucks fresh off the assembly line and some with no restoration or refinishing done, and hunted down several trucks in salvages, examined them very carefully, and got a few answers as to what parts and colors were original; and they were the same answers Jim Carter gave me. 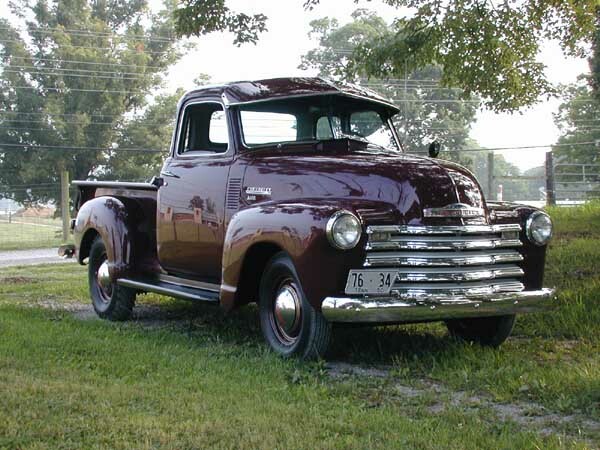 If I ever do another project with a GMC or Chevy truck, I’ll not bother with any other source of parts or information besides salvage yards and Jim Carter’s Antique Truck Parts. I’ve been driving my antique for 14 years and am still pleasantly embarrassed by all the head turning it gets. I still have a “to do” list of 7 items. I’d also like to add a license plate holder that reads “Prehistoric Silverado”. 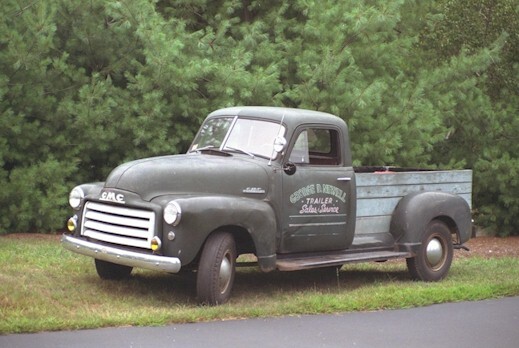 I bought my ‘1951 GMC in ‘1991 and like many people, eventually I found my way to Jim Carter’s shop door…or more correctly his catalog and mail order business. At that time, his catalog was just being updated which is still the case! It’s constantly being updated. I wish that I had all my old Jim Carter catalogs to go back and look at them because of what is now available versus what was not available from the catalog then. Trust me, the catalog is a LOT thicker now. He used to go from ‘1934-‘1959 in one catalog! Actually I think his first catalog was from ‘1934-‘1972. 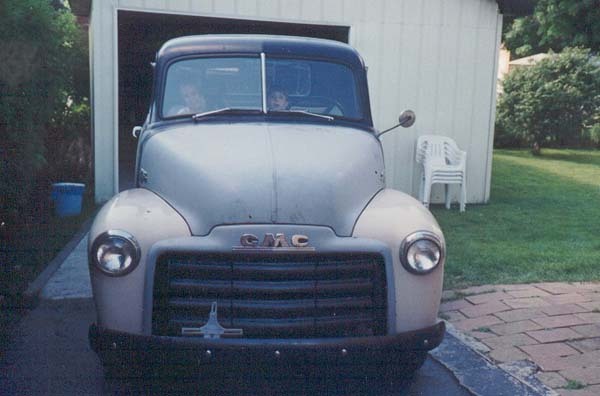 My ‘1951 GMC 3/4 ton truck was a barn fresh low mile original vehicle that had less than 21,000 original miles on it when I bought it. 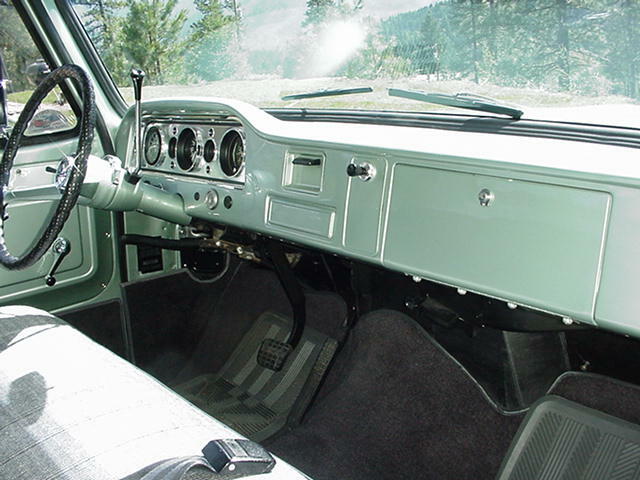 It has a number of unique factory options like the canvas and wood bed with tin lining and fender mounted rear directional signals. I have never put the canvas back on the huckster bed because I was so proud of how the wood looked when finished natural but still plan to some day. It looks like an Advance Design Covered Wagon with the canvas on. I am thinking of getting a US Parks Service logo for the door if I put the canvas back as it looks like a forest truck with the canvas on. 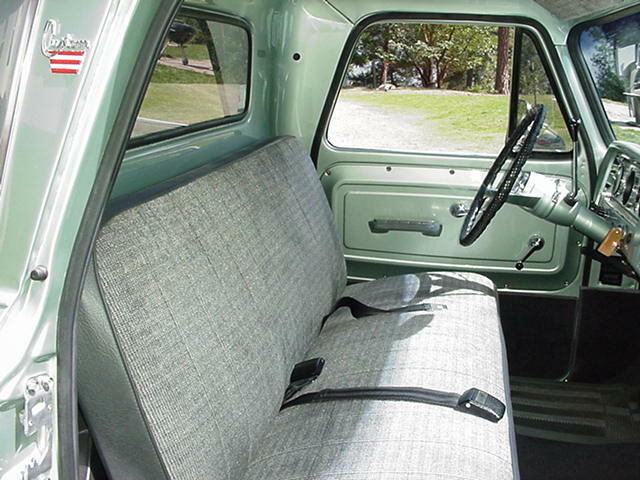 This ‘1951 GMC came as a stock truck in Brewster Green with the following factory options: a fresh air heater, Pyrene Fire Extinguisher mounted in the cab corner behind the passenger’s head, huckster bed with canvas and galvanized tin lining, and 4 speed synchromesh transmission. The dealer added GMC air horns under the hood, signal stat rear only directional signals, Unity fog lights, and a Unity Spotlight. 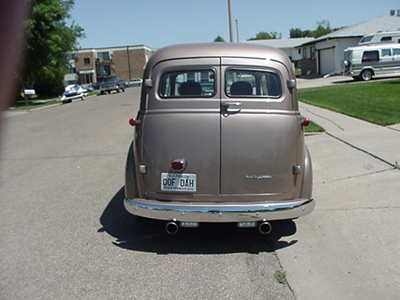 I added an original restored radio, step plates on the running boards, and a rear bumper. 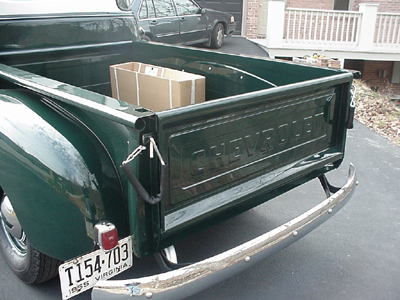 I got the radio, step plates, bumper, and 3/4 ton rear bumper brackets from Jim. I replaced my bumpers with stainless which is the ONLY way to go as far as I’m concerned. 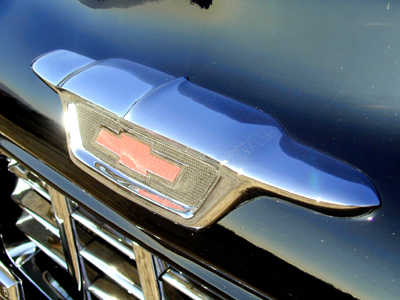 They are easy to maintain and will take some scuffs and buff out easily unlike chrome which is shot once scratched deeply. I think I paid $325 for the radio completely restored like new and that was about 7 or 8 years ago. 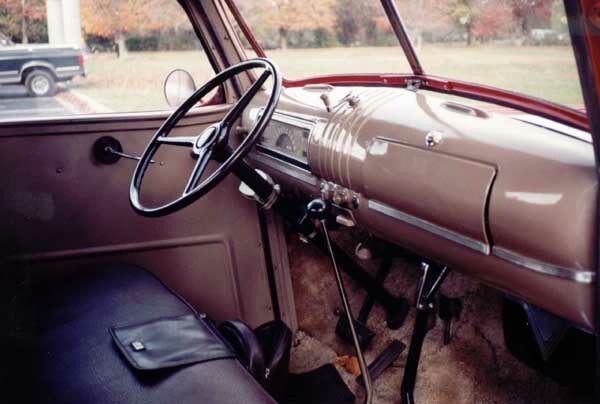 Now the original ‘1947-‘1953 Chevy/GMC radios are few and far between. Put my name at the top of the list of satisfied Carter customers. 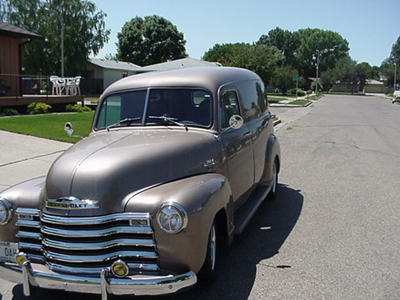 I bought (and continue to buy) virtually everything from Jim including all the rubber, a ‘1951 driver’s side door – one year door hard to find, left front fender, and too many other new, reproduction, and used parts to begin to list. A few years later I was back again. 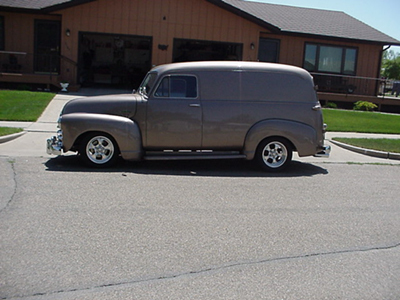 Jim was able to supply me with some hard to find parts when I was working on my ’51 GMC Suburban. 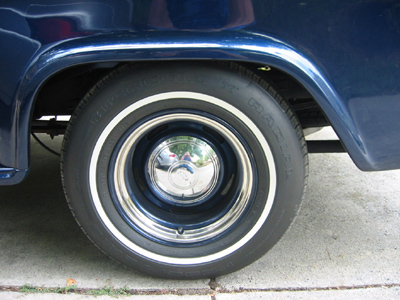 I wanted to run the older (‘1930’s & 1940s) artillery style wheels on it but wanted to keep the original GMC clip style hubcaps and Jim had a full set of the artillery wheels that were NOS! 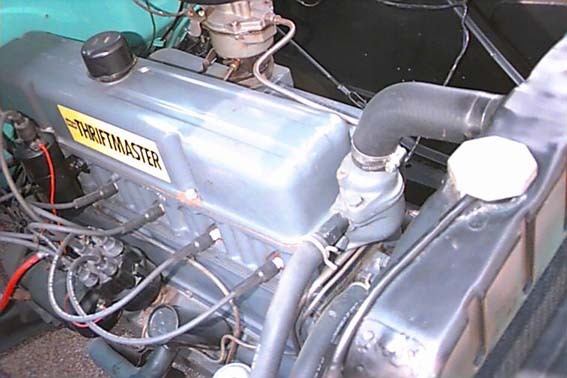 I also got a 4 row radiator from him that worked GREAT with the automatic transmission cooler in it! 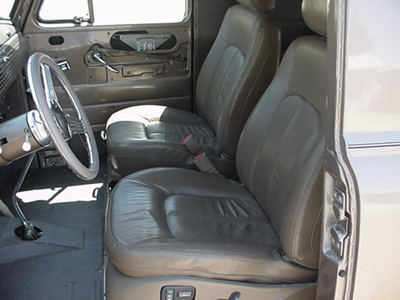 Many of the Suburban parts are only available used and Jim was able to help with everything except a 3rd seat which I never did find. 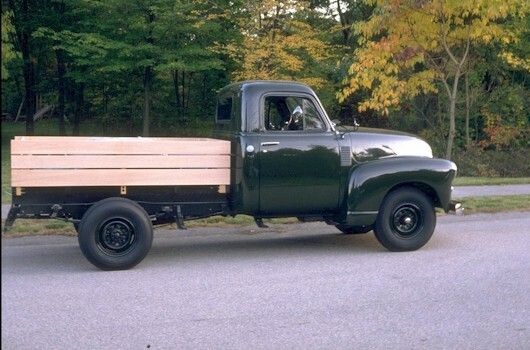 I haven’t done too much to my ‘1951 3/4 ton Huckster since the beginning of ’95 but drive it and enjoy it. 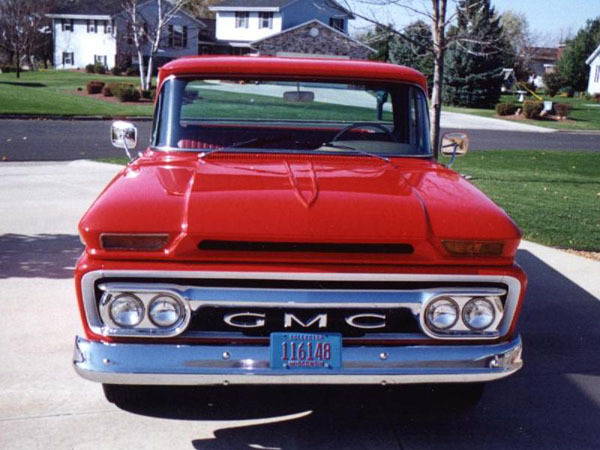 I sold the Suburban and have been thinking about trying to find a ‘1954 – 1955 1st series GMC one ton with a HydraMatic and DeLuxe cab as that is probably my all time favorite GMC pickup. 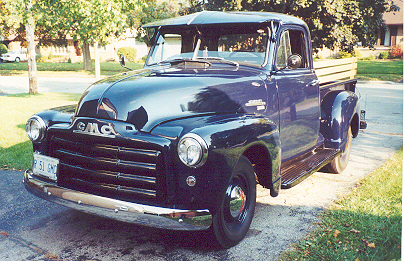 I have had many fun miles in my GMC trucks which sport a lot of Jim’s parts. I wish continued success to Jim and his business and I’ll do what I can to keep you going if I can find the right GMC! 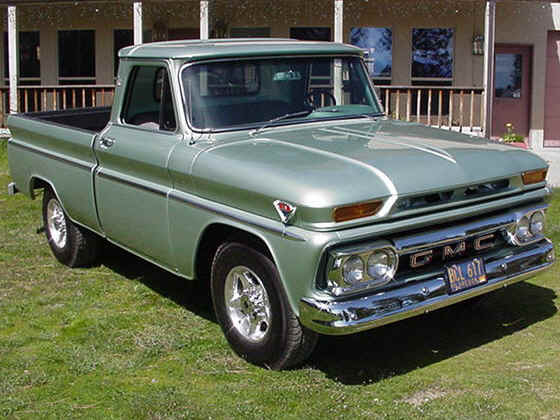 My truck is a 1966 GMC three quarter ton pickup with a short Fleetside bed. 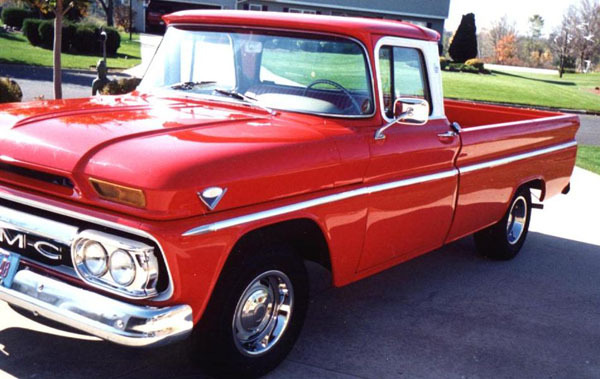 This truck came to me with the original factory build sheet showing a build date of 6-6-66, and factory equipped with the optional 351 cubic inch V-6, turbo 400 transmission, power steering, power brakes, 4.10 locking rear end, heavy duty springs, and custom cab. 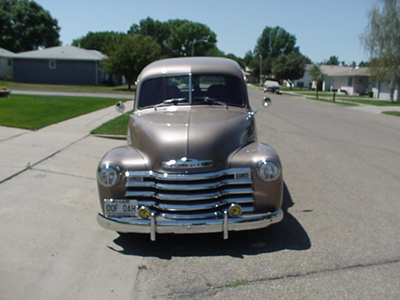 It was originally a two-tone truck, green and white, but I had it repainted a 1973 Cadillac color, Sage Metallic. It has just over 50,000 actual miles on it. I’ve owned it for about 5 years. I bought it from a neighbor who had bought it at the estate sale of the original owners about a year before. 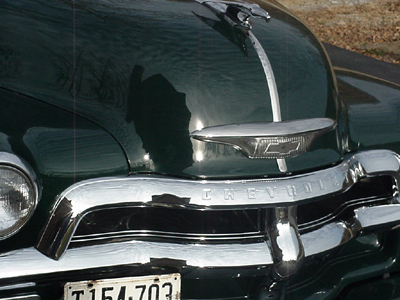 It was in great shape – no rust and no dents. 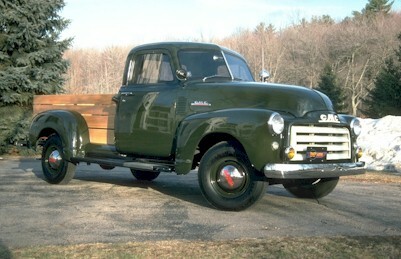 About a year ago, I finished a complete restoration of this truck which took me about 18 months. 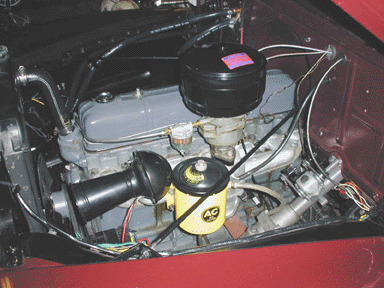 The running gear (engine, transmission, rear end) was in excellent condition, due to the low mileage. The paint, however, was badly oxidized. It now has far more paint, and far better quality paint (Sikkens) than it left the factory with. 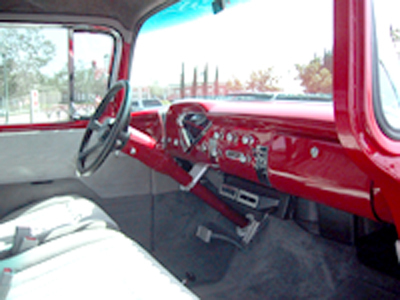 Although the truck is stock mechanically, I took the opportunity during the restoration to perform some comfort and cosmetic upgrades, such as: carpet with heat-resistant sound-deadening mat underneath it, carpeted door bottoms and kick panels, new seat padding and upholstery with inflatable lumbar supports, tachometer and clock, electric fuel pump, chrome plated valve covers, Thermo-dyne coated exhaust manifolds, dual exhaust, interior tailgate latches with cables to replace the original chains, spray-on Armacoat bedliner, and hitch receiver built into the original step bumper. 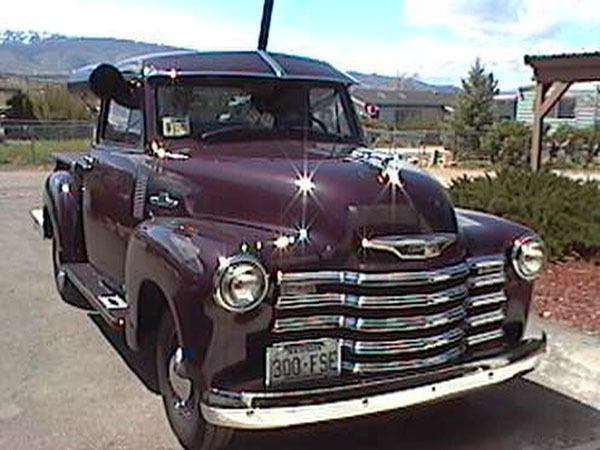 I’ve taken it to many car and truck shows since the restoration was completed. 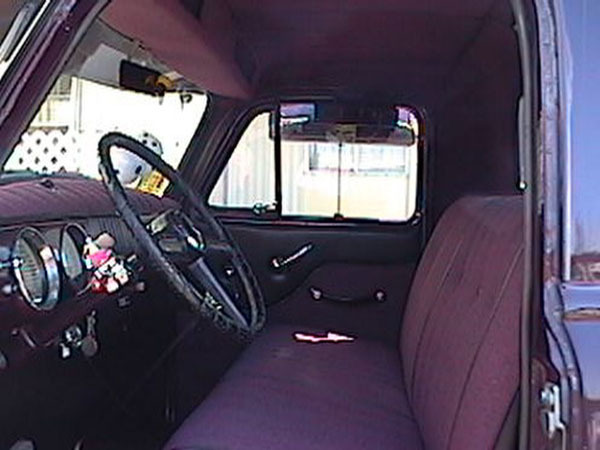 It’s won trophies or plaques at nearly every show, including second in class at the West Coast Truckin’ Nationals in Paso Robles, California in March, 2000. 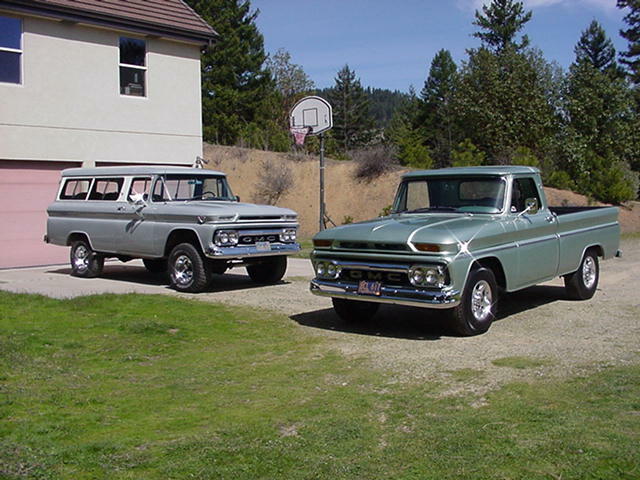 During the restoration process, I acquired catalogs from about a dozen of the largest Chevy/GMC restoration parts suppliers across the country. I tried ordering parts from most of them, just to see how they compared in price, service, and parts availability. Although I had a couple of bad experiences, such as my credit card being charged right away, but waiting several months for the part after being told it was in stock, most of my experiences were good. I must say, though, that my experience with ordering from Jim Carter was unsurpassed – great customer service, quick shipment, and quality parts! 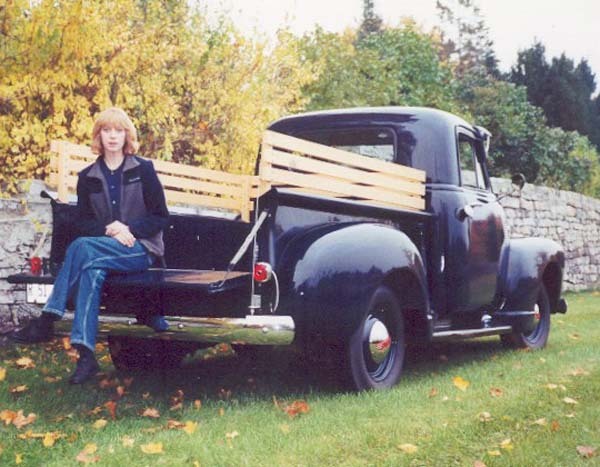 I learned that GM didn’t build any short bed 3/4 ton pickups. 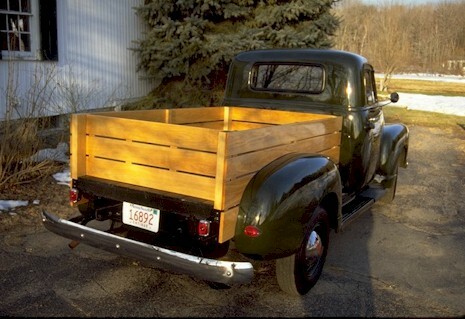 When I asked Ed about his truck being a short wheel base 3/4 ton, he sent me the following e-mail. Nice truck Ed. …. This truck is definitely a three quarter ton short bed. 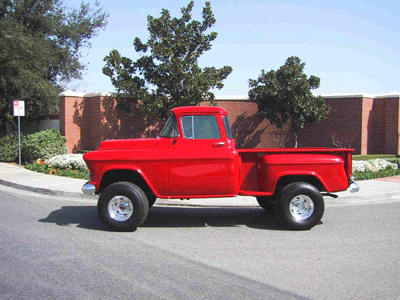 It came from the factory as a long bed (127″ wheelbase). I shortened the frame 12″ behind the cab and cut another 8″ off the tail end. 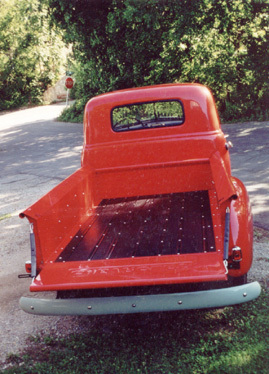 The wheelbase is now 115″, and a short bed bolted on perfectly when I was done. I don’t know if anyone else has ever done this, but it draws a lot of attention at the car and truck shows it’s been in.